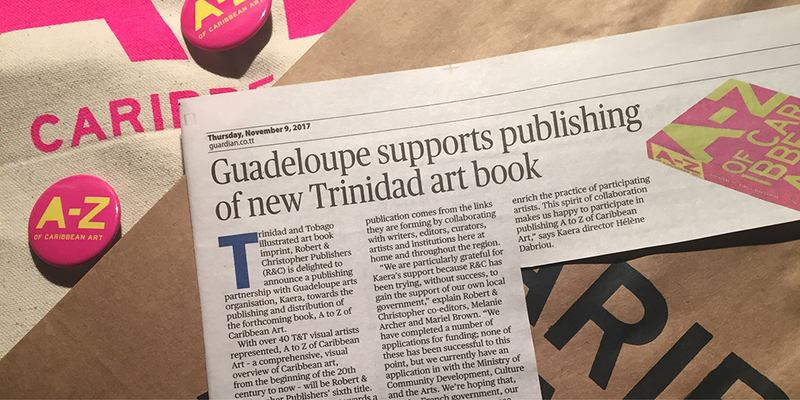 Trinidad and Tobago illustrated art book imprint, Robert & Christopher Publishers (R&C) is delighted to announce a publishing partnership with Guadeloupe arts organisation, KAERA, towards the publishing and distribution of the forthcoming book, A to Z of Caribbean Art. With over 40 Trinidad and Tobago visual artists represented, A to Z of Caribbean Art – a comprehensive, visual overview of Caribbean art, from the beginning of the 20th century to now – will be Robert & Christopher Publishers’ sixth title. R&C is currently working towards a Trinidad launch of A to Z at Bocas Lit Fest in late April 2018. Shell Trinidad and Tobago Limited has made a financial contribution that has been applied to the research and writing phases of the book. R&C has also raised funds through a crowdfunding campaign. While KAERA’s contribution will cover part of the cost of printing the book, R&C is still actively fundraising to cover the balance of costs needed to produce a book of this calibre. Robert & Christopher Publishers is telling a Caribbean story through the A to Z of Caribbean Art – one of a shared past, connected cultural identities and unfolding selfhood. The strength of this publication comes from the links they are forming by collaborating with writers, editors, curators, artists and institutions here at home and throughout the region. KAERA is a Guadeloupe-based organisation that promotes artistic achievement in digital or traditional form. KAERA works collaboratively to create and curate art-centred events that will bring greater recognition of Guadeloupean artists. “We believe that collaboration between the Caribbean islands can only strengthen and enhance our international profile, as well as enrich the practice of participating artists. This spirit of collaboration makes us happy to participate in publishing A to Z of Caribbean Art,” says KAERA director Hélène Dabriou. Robert & Christopher Publishers (R&C) is a small and ambitious illustrated art book imprint based in Trinidad and Tobago. Its primary concern is to produce high-quality books that document and elucidate our Caribbean story, as seen through the eyes of Caribbean artists. R&C’s dedicated team aims to produce the highest quality of relevant books that will be accessible to a wide reading and creative audience, in Trinidad and Tobago, the Caribbean and internationally. R&C is the first Caribbean imprint to have a book distributed by Distributed Art Publishers (DAP), the most prestigious distributor of illustrated art books, with clients that include the Museum of Modern Art (MoMA), the Guggenheim and many more. As a result, R&C’s books can be found in the libraries of MoMA, The Metropolitan Museum of Art, Columbia University, New York University, The University of Virginia, The University of California. Our titles can also be found in local and regional institutions including The University of the West Indies, The University of Trinidad and Tobago, the National Gallery of Jamaica and many more. In addition to its most recent title, See Me Here: A Survey of Contemporary Self-Portraits from the Caribbean, Robert & Christopher has also published: Pictures from Paradise: A Survey of Contemporary Caribbean Photography, Che Lovelace: Paintings 2004 – 2008, Meiling: Fashion Designer and Barbara Jardine: Goldsmith. In 2014, R&C was invited to co-curate an exhibition, “Pictures from Paradise,” with Wedge Curatorial Projects in Toronto, Canada, as part of the annual CONTACT Photography Festival – the largest public photography festival in the world.